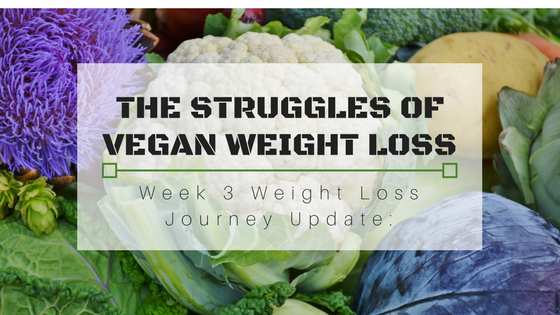 Although vegan weight loss can be as much of a struggle as other approaches, I strive to remain optimistic. This week I lost an additional two pounds. That brings me closer to officially breaking the 300-pound mark which has plagued me since 2009. I feel magnificent! And I intend on continuing this wonderful journey that has brought me such joy and enthusiasm for life. Every day that goes by I am more driven to lose the weight and share it with you guys. My hope is that this journey will also motivate you in even the smallest of ways so that you can also achieve complete transformation in whatever area you choose. Not the kind that lasts for a few days, but the kind of transformation that last your entire lifetime, the kind that inspires greatness in your own community. You can be the catalyst for your own transformation and that of your loved ones. It all starts with you. Week 3 was challenging, evident by the poor show of progress. Every week I strive to lose 5 pounds. If I don’t, then I feel like the week was a waste. My wife tells me my goals are unrealistic due to the level of discipline and punishment required to reap those kinds of results. I consider myself an idealist, I feel I can do anything! I will always strive for the impossible, and if I land on spectacular then we can consider it progress. Nonetheless, my wife says I am being too hard on myself. After all, WebMD advices that aiming for one or two pounds a week is the healthiest way to lose weight. Lose it too fast and you risk the loss of muscle, bone, and water instead of fat. This can be counterproductive as the goal here is to get rid of fat. For anyone on a weight loss journey: Don’t beat yourself up so much. Be kind to yourself and focus on your victories. Exercising is something that I talk a lot about because it’s a struggle. This week I didn’t do enough exercise. I did about 30 minutes on Monday, Thursday, and Friday. Last week, when I lost six pounds, I exercised every single day for 30 minutes. For this reason, I believe I only lost two pounds this week. Ideally, 4 days of working out are ideal for optimal weight loss. I am focusing more on bodyweight exercises as opposed to working out with gym equipment. I feel the more natural your workouts are, the better it will be for your body overall. I’m not big on spending a lot of money on expensive gym equipment that only focuses on certain muscles. Body weight exercises are the answer for me. I am going to be speaking more about my exercise routine in the coming weeks. 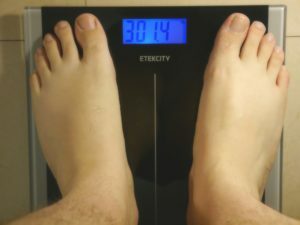 I’m convinced that at 301 pounds, it’s easier to lose weight by simply dieting. But a time will come when eating healthy will not be enough. When I hit a plateau I will have to sweat like I have never sweated before. Nonetheless, I shall listen to my wife and not beat myself up so much. I want to focus on the positives – the good things that have resulted from my weight loss so far. I’ve been feeling great. My body feels healthier and energized. When I was over 350 pounds I could not stand for longer than 15 minutes without my back and feet hurting. My heels would practically burn with pain the longer I stood. But now I’ve come to prefer standing. I guess I’m just tired of sitting. I’ve even thought about getting one of those standing desks so that I can stand while I trade in the mornings. Among other positive symptoms of weight loss, I feel comfortable in my car again. I used to feel like a sardine in there. I’m a big guy. I’ve been big all my life, always the tallest in the class. Now add an extra 150 pounds to an already large, six-foot-three frame and we’ve got a problem, folks. Everything from getting in cars and sitting in baseball stadium chairs becomes hell. Coincidentally, when I went to Marlin’s Stadium a few weeks ago, I noticed I fit in the regular chairs. Weighing 350 pounds I was forced to buy more expensive seats because they are wider and more spacious. I’m happy I will be saving money when I go to games from now on. The challenge this week was less processed foods and I failed! I don’t think I passed the test. Not eating processed foods proved to be a worthy adversary to overcome. Processed foods have been the backbone of my diet since I was a child. It’s difficult to leave the taste behind. I am the kind of vegan who loves vegan mayo, white bread, vegan mock meats. Look, it’s not that I ate terribly. I did not gorge on veggie burgers, Boca patties, or stacks of pancakes. But it was much harder than I anticipated. I’ve been eating a certain way all my life and it’s difficult to break those habits. If anything, this week forced me to notice that I was falling back into the same patterns. My plates were starting to look like they used to: meat, rice, and fried plantains. Sometimes I’d add tomato and avocado or a banana. Now that I’m vegan, I’ve been eating virtually the same meal: veggie meat, rice, and fried plantains. I’m not saying that these foods are necessarily unhealthy but what is missing in this picture? Where are the vegetables??? Trying to cut out processed foods, left me wondering what to replace it with. My plate felt incomplete. Now it seems obvious that I was missing a crucial food item: vegetables. Although I’m not their biggest fan, the benefits of eating vegetables are many. Vegetables are ideal for weight loss because they are low in fat and calories and have many essential nutrients like fiber, vitamins, and minerals. They contain a ton of antioxidants which protect the body from damage caused by free radicals. This means that they lower the risk of cancer. They also promote heart health and reduce inflammation in the body. Instead of focusing on what I can’t eat, I’m going to focus on what I can eat. It’s generally a good idea to consume a broad range of vegetables. I like Dr. Michael Greger’s Daily Dozen Checklist where he gives you an idea of the type of foods you should try to eat every day. Among other things, he recommends a combined 9 servings of fruits and vegetables. He distinguishes between greens, cruciferous vegetables, and other vegetables. I recommend his video for anyone trying to get an idea of what they should eat as a vegan to lose weight. It’s a great starting point. 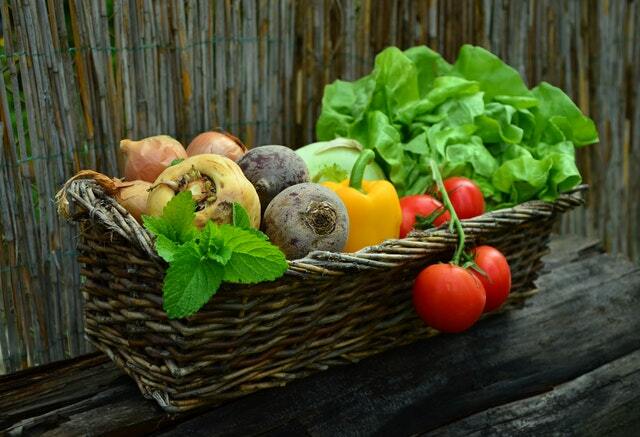 As always, I invite you to join in on the challenge and add more vegetables to your diet. For this week, don’t focus on taking things out of your diet and what you should not eat. Instead, focus on abundance and see how much vegetables you can eat this week. I guarantee that you will feel better. Start with your favorite vegetables. I love cauliflower, corn, green beans, kale, and cabbage. Which vegetables will you try next? Or what vegetables to do recommend? Let me know in the comments below.